If I don't have it, you don't need it. August 15 just past would have been her 106th birthday. 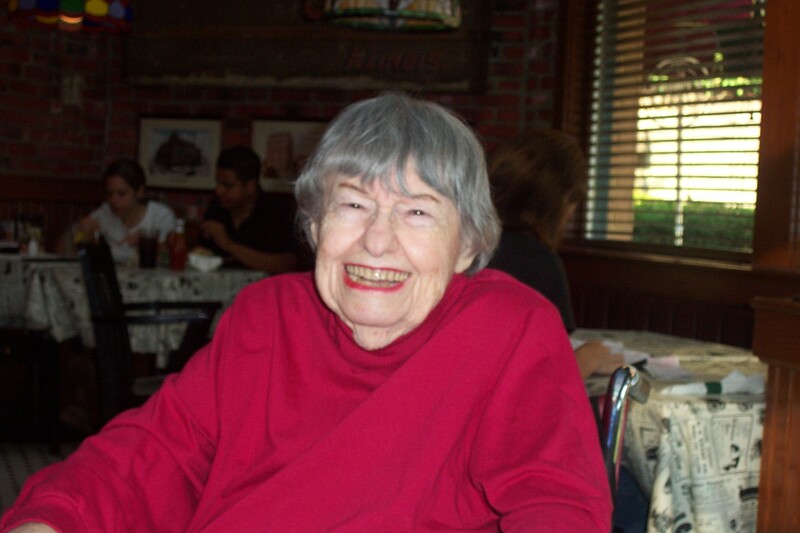 My Mom, Sally Horn, died on Sunday, July 26, 2009. Beloved mother, wife, mother-in-law, and grandmother. Sally was born Sarah Bloom on August 15, 1912 in Kremenchug in the Ukraine. Her parents were Eli and Mary Bloom. She came on a ship to Toronto, Canada when she was a one year old baby. She lived on College Street in Toronto with six brothers and one sister. Her sister was our Aunt Vera and her brothers were Uncles Hy, Max, Morris, Sam, Albert, and Louis. She told me of watching a parade for veterans coming home from World War I when she was little. She worked sewing buttons in a blouse factory in Toronto with her dear friend Shirley Siegal. She had a friend in Brooklyn named Yetta Spiegal whose paintings filled the walls of her apartment. Mom married my father Meyer Horn on June 20, 1943 in Toronto. Dad was in the US Army Air Corps at the time. Mom moved to New York and became a US citizen, and lived in the south Bronx, at 1353 Sheridan Avenue, where my brother Gary and I grew up, until we moved to Co-op City on December 30, 1969. Mom and dad liked to travel. We all went to Washington, Lake George, and Toronto, and in 1976, we drove across America for an entire month. Mom and dad traveled overseas to Hawaii, Spain, Morocco, Portugal, Switzerland, Israel and many more places. Mom provided some of my best childhood memories when she took me to Manhattan in the subway to see the holiday decorations in the department stores like Macy's and AM Best. Also, she took me to be in the audience of several kids TV shows, including Wonderama and The Bozo show. Mom was devoted to her sons and always went out of her way for us. Besides travel, she loved reading, bingo, and doing crossword puzzles. In later years she adored her grandchildren and her grandson David loved to play with her walker and wheelchair. She lived a long and full life and I very much miss her. I have for sale most earlier State and America the Beautiful Quarters, half dollars, golden (Sacagawea) dollars, presidential dollars, and two dollar bills. This site was last updated on February 21, 2019.